A few words of explanation: As you may well know, Nebraska recently passed a concealed carry law. Omaha, however, still has an ordnance on the books prohibiting concealed carry that supercedes that state law. The City Council is now considering repealing the ordnance, which has led to a lot of disgusting anti-gun rhetoric being spouted off. While considering how to respond to this, I came up with a few Second Amendment...modifications, if you will. And things just went from there. So, without further ado, the Bill of Rights, v2.0. I. Congress shall make no law that includes the words "Christianity," "Christ," "God," or any other deity associated with white males; or abridging the freedom of speech, excepting American flag burning, which isn't really speech anyway; or the right of the people peaceably to assemble, unless they burn American flags, and to petition the Government for a redress of grievances, as long as they don't burn American flags. II. A well regulated police force, being necessary to the control of a population, the right of the police to keep and bear Arms shall not be infringed. A well regulated group of hunters, being necessary to the stomach of a free nation, the right of the people to keep and bear hunting rifles and shotguns shall not be infringed. III. Not important, and not applicable. What were they thinking anyway? I think ol' Madison was being just a little paranoid. IV. The right of Congressmen to be secure in their persons, houses, papers, and effects, against unreasonable searches and seizures, shall not be violated, and no Warrants shall issue, but upon probable cause, unless you're a teenager or drug "dealer", supported by Oath, affirmation, or anonymous informant, and particularly describing the place to be searched, including your entire neighborhood, and the persons or things to be seized, including your neighbor and your dog. V. No person shall be held to answer for any capital, or otherwise infamous crime, unless on a presentment or indictment of a Grand Jury. Sometimes. 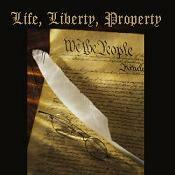 Nor be deprived of life, liberty, or property, without due process of law. Again, sometimes. Private property shall be taken for public or private use, without just compensation. VI. In all criminal prosecutions, the accused shall enjoy the right to a speedy and public trial, by an impartial jury of the State and district wherein the crime shall have been committed, which district shall have been previously ascertained by law, and to be informed of the nature and cause of the accusation; to be confronted with the witnesses against him; to have compulsory process for obtaining witnesses in his favor, and to have the Assistance of Counsel for his defense. Unless you're a terrorist. VII. In suits at common law, where the value in controversy shall exceed twenty dollars, the right of trial by jury shall be preserved, and no fact tried by a jury, shall be otherwise reexamined in any Court of the United States, than according to the rules of the common law. Also, the right to sue someone for injuries incurred while breaking into their home shall not be infringed. VIII. Excessive bail shall not be required, unless you're a teenager, nor excessive fines imposed, unless you're a teenager or a drug "criminal," nor cruel and unusual punishments inflicted. IX. What the hell does this one even mean? I think the founding fathers were smoking a little too much hashish. X. N/A. The states are no longer considered separate entities, and therefore have no powers. Hope you enjoyed my version of the Bill of Rights, and feel free to make your own additions in the comments.